Replacement traffic cone sleeve 450mm. Reflective cone sleeve conforms to BS EN 13422:2004 .. Replacement 750mm Traffic Cone Starlux Sleeves Conforms to BS EN 13422:2004 .. Replacement 1m Traffic Cone Starlux Sleeve Conforms to BS EN 13422:2004 .. Replacement 450mm No Waiting Cone Sleeve ..
Reflective sleeve to fit a 750mm cone. 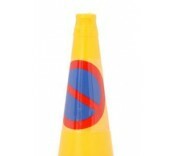 ..
500ml Heavy duty, non-chlorinated spray adhesive Ideal for bonding cone sleeves to the actual c..
Retro-reflective sleeves for road and no waiting cones, that increase visibility from a cone when the original sleeve becomes worn. 'Danger overhead cables' sleeve (reflective sleeve to fit 750mm cones) and sleeve adhesive are also available. When using traffic cones, it is important that they 'stand out' from other visual stimuli, and are recognisable from a distance. This means ensuring sleeves are replaced, so that traffic cones maintain their effectiveness. These reflective cone sleeves for traffic cones all conform to the standards presented in regulation; BS EN 13422:2004. Replacement cone sleeves for traffic cones of sizes 450mm, 750mm and 1m are currently available. Remember that larger traffic cones are more suitable when a road user must see them from far away. An example of using larger traffic cones would be on a road where drivers are usually going at a high speed, such as a dual carriageway or motorway, because it gives them more time to react from when they first see the cone/cones. To help bond these reflective cone sleeves to the road cones, we have a 500ml heavy duty spray adhesive in stock, that comes recommended for binding cone sleeves to the cones. An adhesive is any substance applied to the surfaces of materials that binds them together and resists separation. Coming in an aerosol spray, particles are spread evenly across the road cone's surface, making for an effective use of surface area, distributing glue steadily, and drying quickly. Our adhesive is CFC free and non-chlorinated, making it more environmentally friendly and user safe than other heavy duty adhesives.